We then moved on to to talking about what Toby calls the triangle of success, which I have illustrated below. 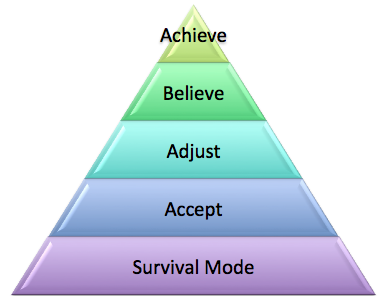 We usually start at the bottom of the triangle in survival mode, as for most of us for change to happen we must first experience our crisis point. For most suffers the first 6 months + we are in survival mode, where suffers often are suffer from extreme push and crash cycles, as on a good day you over do it massively and then fall back into what Toby likes to call the valley of death. This was defiantly the case for me, I kept pushing myself beyond my ability as I didn’t listen to my body, I kept trying to keep up with my old life. Once you accept your diagnosis, accept where you are at the moment and your limitations you can go on to make changes. You need to accept that you can’t do what you used to, you need to give up on various things in your life so that you can focus on your recovery. In your head you are likely to think that giving up things (like work, volunteering, school/studying, social activities, driving, household activities) is a bad change; but by letting go and accepting your new limitations is very good. As without doing so you will continue on the push crash cycle, keep plummeting into the valley of death. With out breaking this push crash cycle how can you hope to get better? The aim in to do things without feeling worse, activity management is key an example of this is using Toby’s credit system, as well as good rest, sleep and nutrition . His credit system really helped me start to take control of my life again, it helped me even out my push/crash cycle, I talked about this in more detail in a previous post (Link), whilst I still push and crash a bit but over all I don’t slip into as huge valley of death or at least they only last a day or so rather than weeks. Hope and belief is key! Without hope we have nothing. This is so true, without the hope and belief that you can over come this illness, where self care is the most effective way to manage and recover from this illness. In various post I have talked about the impact of positive mindset (link) I think it is key not just to recovery but to most things in life for example if you don’t believe you will get a job, pass that exam, finish the race, stop smoking, loose weight pretty much anything how do you ever think you are going to do it? Toby made it clear that you still need to do the right things but hope is key. Remember recovering from CFS/ME is endurance race not a sprint . With the right adjustments, belief and not forgetting lots of time, rest and trial and error, achieving is possible. Achieving isn’t about massive gains and results such as getting fully better. Instead it is about the small things, celebrating the little mile stones. Toby told a story of how during his recovery he was attending school on limited hours, where he had built up from walking just 1 minute a day, it came time for PE class and he was terrified, so when it came time for the class, it started out with a 200m walk down to the beach (I know! How jammy to have a beach so close) well he managed to walk down to the beach with the rest of the boys, and proceeded to watch the rest of the boys play football for the rest of the lesson. This was the hardest thing he had done up to that point. To his old-self it was nothing, but it was an achievement at that point in his recovery. Over time all of the little achievements and milestones will build up to big ones. When thinking of long term goals stop thinking my goal is to be fully recovered and being ‘better’ but instead focus on improving your functionality and your quality of life. This is something that made me really think, because I have to admit that I talk about wanting to be better all the time but I guess it isn’t really that simple your not one day going to wake up and think wow I’m recovered today. I really thought about this even more, on Monday I went for coffee with a friend I hadn’t seen in ages, who actually so it happens suffered from ME/CFS when she was in her late teens/early twenties, what I find interesting is that she accepts that she is fully recovered but couldn’t pin point from when she felt that she no longer suffered from ME. So rather than focusing on being ‘better’ or recovering from this illness, I am going to focus on getting to a point where I can say to a friend yes ill come to that, without having to work out the credits for that event and see if I enough to do it, or to get back up to working full time or at the very least 4 days a week. Rather than thinking of getting better, think about and aim for doing more and not feeling worse, and the better will come with time. So how can I get there? Well most importantly Toby says is to: Stop! the Push and crash/ up and down cycle. Instead listen to your body work out your baseline rather than continually going into the valley of death. Basically it all boils down to listening to your body, if you feel symptoms coming on you know you have done too much and risk plummeting down into the valley of death. A good way of doing this and something that I have been doing since about April this year is using Toby’s credit rule, I wrote about this in a previous post (Link) it is very similar to spoon theory for those of you who use spoons. It boils down to you having a certain number of credits a day and if you over spend you will suffer. Pacing is key!!! The aim is to maintaining and then progress/increase. Only increase once you have maintained the previous level of activities without any negative effects, and the progress should be a maximum of a 10% increase. There is no point in going from zero to hero, if come crashing down into the valley of death. I very much suffer from falling into the valley of death (Link) but usually only after a hell yeah event (Link). My valley of deaths are few and far between and they last for shorter periods of time, so I must be doing something right. Avoid push crash much possible. Stop aiming for perfection as you are just setting yourself up for failure. Lower expectation on ourselves and what you can do, otherwise suffer long term. Learn from valley of death- weigh up overspending on credits, if the event is a hell yeah do it and accept that there will be pay back.